Lots of movies win Oscars and things, but only a select few enter the lexicon, and Groundhog Day is one of these. It has elbowed aside the original meaning of its title; these days when people say that something is "like Groundhog Day," it's a pretty safe bet that they're not referring to the actual holiday (such as it is). There hadn't been as dramatic an episode of semantic repurposing until 2005, when the word "bus" started to appear only after the words "thrown under the." I'd been meaning to see Groundhog Day again for a while and finally got around to it. What a great movie! It's not the funniest movie (though it is funny), and the performances of the supporting actors are nearly all too broad, but what makes it a classic is that it starts with a brilliant premise and then actually explores all of its nooks and crannies. In this regard it is much like the book Memoirs of an Invisible Man by HF Saint, which I think I will reread soon. In both cases, the people responsible really thought through all the implications. It would be fascinating even if it were otherwise empty, which it isn't. Roger Ebert quotes The Independent reporting that Groundhog Day is "hailed by religious leaders as the most spiritual film of all time" and adds that "They have a point, even about a film where the deepest theological observation is, 'Maybe God has just been around a long time and knows everything.'" This irked me. Religion is not the same as theology. Theology is just so much speculation about the Flying Spaghetti Monster. Religion, at its best, offers more than myths to trawl through looking for wisdom — it offers wisdom straight up. "I've been thinking about life, and here's what I've figured out." And when it does so, whether it's Ecclesiastes or the Dhammapada, it tends to make a lot of the same observations about life that Phil Connors makes in Groundhog Day: that every day's pretty much the same, that nothing you do matters in the end, that all the self-gratification in the world is ultimately unfulfilling, that in the face of all this a key to overcoming despair is to make the inside of your head a pleasant place to be... I'm not defending the Independent quote, not least because I hate the word "spiritual," but I would suggest that, like Stephen Hawking once wrote about using equations in a book, every "theological observation" a film makes automatically halves its worth. 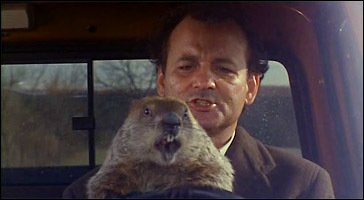 So Groundhog Day actually comes out ahead! I don't want to pick on Ebert, since his article is otherwise pretty dead-on; at the end of it, for instance, he writes, "Tomorrow will come, and whether or not it is always Feb. 2, all we can do about it is be the best person we know how to be. The good news is that we can learn to be better people. There is a moment when Phil tells Rita, 'When you stand in the snow, you look like an angel.' The point is not that he has come to love Rita. It is that he has learned to see the angel." Yes. Similarly, while still remaining more or less the same guy, he has gone from having nothing but contempt to the Punxsatawney hicks to loving them. I agree that this is pretty much the secret to life. But it is not so easy. Moving from the screenwriter of Beyond the Valley of the Dolls to that of the Academy Award-winning You've Got Smoochies, Dan Shiovitz writes that "I don't understand Adam, because I don't understand how anyone who has seen this (and I assume to write about it he has to at least feel an echo in himself) can still hold so many people in such contempt." It is true! Frequently I remind myself, or am reminded by films like Groundhog Day, that the world is a hateful place if you hate it and a lovely place if you love it, and that, as Dan says, ideally "if you had ever seen a moment of Love like the ones Adam gives in his books, you'd spend the rest of your life loving everyone on the off-chance that one of them might open up enough to give you another glimpse." But I guess that I am fundamentally misanthropic because I keep backsliding into hating all humans. (Perhaps it'll be easier for Dan to understand me in this respect after he reads Evil Creatures, which is much better-written than Ready, Okay! in any case.) It's not too hard to love people in the abstract — Cosmos makes a good case for it — or to make up lovable fictional ones. But loving actual individual human beings is difficult! It requires that when they say or do something that would normally make me dial down my estimate of their worth, I not do so — not that I refrain from saying anything about it, not that I put a mask over my true feelings, but that I honestly continue to hold them in high esteem. I have only managed this with a handful of people, and I don't know what has distinguished my successes from my failures. Like Allen says, "I spend a couple [of] minutes with someone and [he or she] start[s] to seem less like a miracle and more like an unfortunate accident. But not with you. You're the one person [in whom] I always see the miracle. And I have no idea why." Anyway, after I watched Groundhog Day I decided to make it a Bill Murray doubleheader and watched Broken Flowers. In this film, the lead character receives a letter telling him he has a son he never knew about, and he goes on a series of trips to see what the potential mothers of his child are up to. They are, in order, trashy, icy, flaky, scary, and dead, which I think was also the original Spice Girls lineup. Anyway, it's very watchable, which surprised me since I found Dead Man, also by this director, completely unwatchable. But I doubt it will stick with me the way Groundhog Day has.